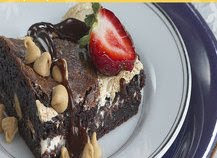 I must admit, I am a chocolate brownie addict...the more goodies in my brownie batter, the better! This recipe by Tupperware is one of my favorite ones to make for my family. I love the marshmallow creme and peanut butter chips that are in it which makes it really rich and delectable. This recipe will take approximately 45 minutes to prepare and will make up to 24 servings. Preheat oven to 350°F. Combine 1/4 cup condensed milk, butter, milk, cake mix and egg white (batter will be stiff) in Prep Essentials™ Mix-N-Stor® Plus Pitcher. Spray bottom of 13" x 9? baking pan with cooking spray. Press two-thirds of batter into prepared pan. Bake for 10 minutes. Combine 1/2 cup condensed milk and marshmallow crème in a bowl and stir in peanut butter chips. With Saucy Silicone Spatula, spread mixture evenly over brownie layer. Carefully drop remaining batter by spoonfuls over marshmallow mixture. Bake for 30 minutes. Cool completely in pan on a wire rack.